Jane offers an amazing Sunday Night Frites, a prix fixe dinner for $15 that I blogged about before. Since the restaurant is more known for their brunch, my sister and I decided to finally check it out. 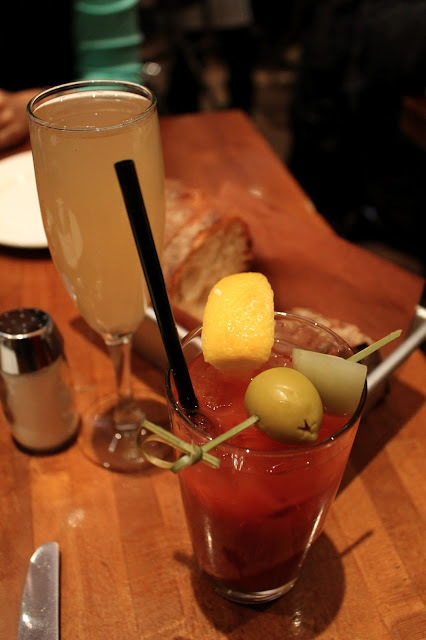 On Sundays, Jane's brunch menu offers several of the Saturday breakfast menu items for just $1 more, but includes an orange juice or complimentary cocktail of bloody mary, mimosa, bellini, screwdriver. Even if you make a brunch reservation, be prepared to wait to be seated. The restaurant was bustling the entire time we were there. Complimentary white and cranberry walnut bread is given. I loved the cranberry bread! Vanilla Bean French Toast, $15: Brioche bread, creme brûlée batter, Vermont maple syrup. The softest, most moist and fantastic french toast I have ever tasted. It was sweet enough that I didn't use the maple syrup. A lovely thickness to each piece of bread. Every bite has a great almost creamy texture to it. 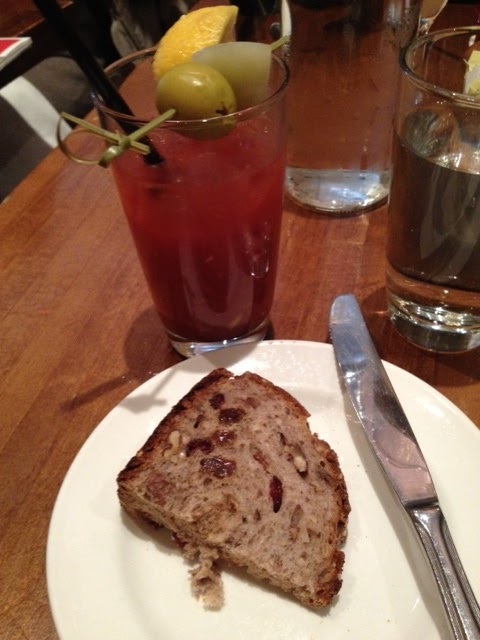 For my complimentary cocktail with the French toast, I ordered a bloody mary. It was much too spicy for my liking. My sister had the white peach bellini, and found the champagne very flat. Both cocktails were disappointing. Brunch special of the day: Short Rib Eggs Benedict, approx. $18: This eggs benedict was superb. Rich in flavor and very tender, the meat and eggs were served over spinach and a buttermilk biscuit. The biscuit was deliciously flaky. I would definitely order this if it is still offered as a special the next time I visit Jane. Rosemary Fries, $5: The fries definitely needed more salt, which is saying a lot coming from me. (I try to avoid adding salt whenever I cook, and I find most snacks and foods too heavy in sodium.) The rosemary flavor was great though. Great post and photos. I definitely need to try their brunch! I only went there for dinner and had a fantastic burger!